On the doorstep of the beautiful Galtee Mountains and the Blackwater Valley lies The Firgrove Hotel where Pat and Brenda Tangney welcome you. Just 35 minutes from Cork City Airport on the N8 Cork - Dublin road, The Firgrove Hotel is just 5 minutes walk from the centre of Mitchelstown. 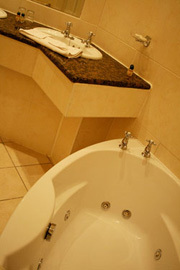 All bedrooms are ensuite and spacious with multichannel television, direct dial phone and tea/coffee making facilities. Each room has a facility for those travelling with their laptops. For the discerning businessperson, the ISDN lines facilitate two way transfer of high volume data. Room service is available on request. All rooms have ground floor access, making The Firgrove Hotel an ideal accesible location for all. Extensive free car parking is available at the private hotel car park. Dining in The Firgrove Hotel is a must. Our award winning menus suit all tastes. Locally produced food and continental cuisine is prepared by our highly trained chefs.